Never have I ever... gone unprepared. Ok, that's not true, sometimes I'm ill-prepared. But you can betcha that I'm not going to spend the night in the woods and not be prepared! 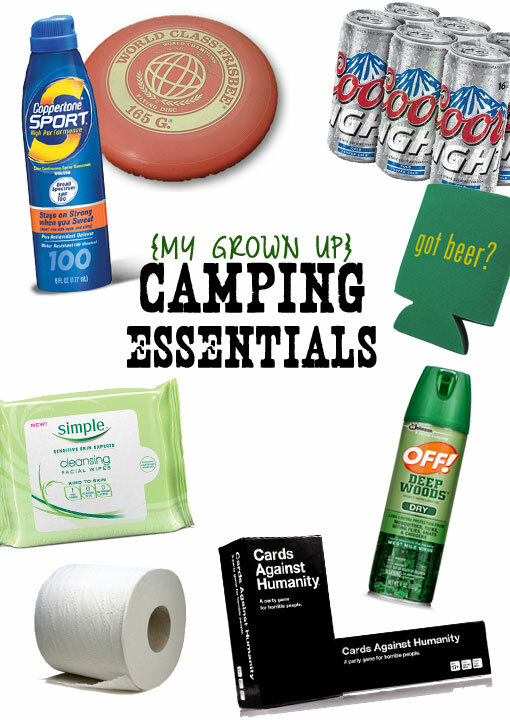 Anyways, here are my camping essentials for a fun filled weekend in the sticks! 1 | Bug Repellant / Sunscreen. A given? Yeah it better be. When you're significant other is ginger fair skinned, you don't do any outdoor activities without sunscreen. And when you yourself are the nectar of the gods for mosquitoes, you also always bring bug spray. A bad burn or too many bites can make your weekend unbearable (more than the ground sleeping/tent thing), so make sure to prevent them! 2 | No-Bathroom Related Hygiene Products. So camping means no potties. No running water. When you are a lady and need to feel clean and fresh even though your red-necking it, there are some great products that work wonders when away from home - and running water. I love facial cleansing wipes. They are PERFECT for camping because they remove the grunge and excess makeup without a full on wash with cleanser, water, a towel...all those things you don't have. Oh, and don't forget the TP toilet paper! 3 | Beverages and Koozies. It's not camping unless there's a beer cracked. Or at least that's how we camp. When you're without a fridge, it's important to keep that beer cold as long as possible in your favorite koozie. 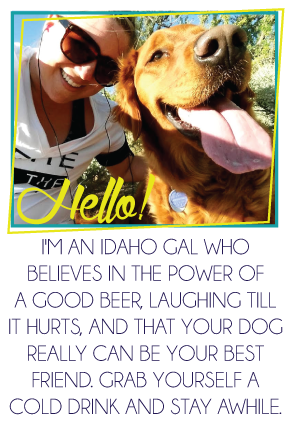 Also, it marks your beer so you know which is yours! We had the Blue Moon summer mixer box and it was delish. Then we followed up with classic silver bullets (with orange juice) later in the night. 4| Things to Keep you Entertained. The woods are grrrrrrreat, but when it's not campfire sittin' time, just sittin' with nothing to do is a whole lot of boring. Make sure to bring things to do - Cards Against Humanity, a football or Frisbee to toss, a golf club and a bucket of old balls...pretty much any activity will do. Or plan a hike or trip to a close by hot springs to break up the day. Watching your drunken friends scoot on their asses all the way down the mountain next to camp is great too - I highly recommend it. 5 | A Positive Outlook. I don't know about you, but sometimes, I can see the negativity in things - like not having a bathroom close by or sleeping on the ground. But going camping I always go with the most positive outlook I can muster. I sit and take the sounds - the birds chirping, the creek running behind camp, the laughter of my friends, and just think to myself, LIFE IS GOOD. Because when you're out camping with friends it is! 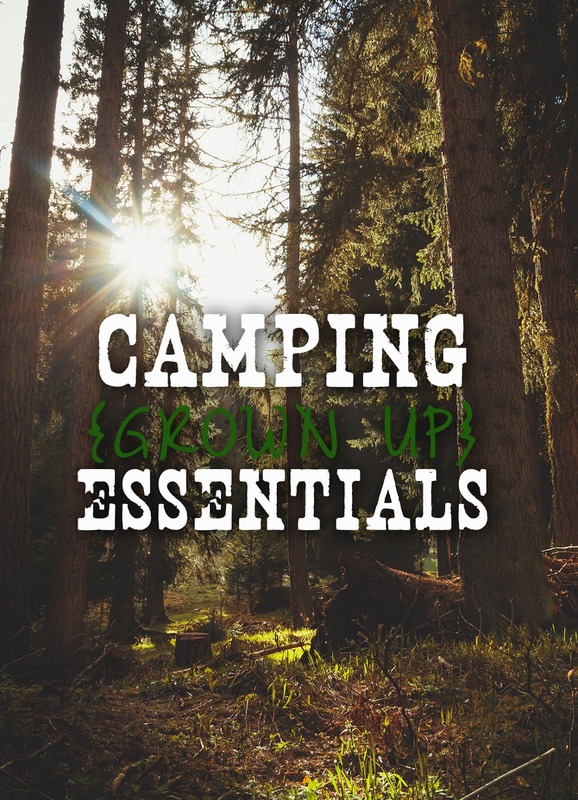 What are your necessities for a weekend camp trip? This is a great list! We haven't been camping in forever and we need to fix that ASAP! I am not a camper. At all. In the least bit. Butttt I would say those make great necessities for all different kinds of trips! I have to admit...I've never gone camping in my life. In the last few years I've decided I want to sometime - I just have never done it yet. But growing up it was NEVER a thing in my family. Which is really strange being from Minnesota and everybody loves the outdoors. So I'm not much of a camper. More of a GLAMper, I think. But Jason loves it and we've never been together... in 7 years of dating. I used to camp a lot in high school and college, but it was mainly an excuse to drink beer. But if we go, these are awesome tips! and I'm going to need to make Smoreos. Hope you guys had a great time! Smoreos? I might just have to marry you for bringing that into my life. We got this amazing tent as a wedding gift and still haven't had the chance to use it yet. That was six year ago. We seriously need to go camping, even if it's just in our back woods. I miss the days of being unplugged. OMG I WANT A SMOREO RIGHT NOW. Okay enough with the caps. That' seriously amazeballs though. I went camping once. It was awful. Beer made it better. I feel like Grumpy Cat saying that, but really, I'm so not into no running water haha. I have yet to go camping! I'm a little scared of sleeping in the woods, especially after watching all the horror movies I've seen as a kid. Even if I did get over the fear of being murdered or eaten alive by a snake (really?) or a bear, I don't know if I could last too long with the whole no bathroom thing. I could probably do it for a few days, but then I'd feel like I need a real shower.. not just some shower in the nearby lake. Maybe I'll give camping a try this summer!